eD@HoMe: My first covers from Latvia! I would like to thanks Atis Verdenhofs for sending these 2 awesome covers from Riga, Latvia! They are my firsts from this lovely north-central European country and also my 70th country in my collection! Atis noticed that I do not have any cover from Latvia and decided to send me not 1, but 2 covers! Thank you so much! 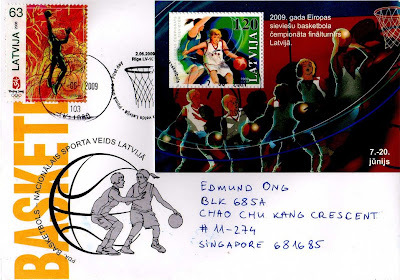 The 2 covers, FDCs from the European Basketball Championship feature a set of 3 beautiful stamps and also a gorgeous souvenir sheet. They were issued on 2nd June 2009 to commemorate the coming 2009 European Basket Championship, universally referred to as EuroBasket 2009 which will be hosted by Poland from Sept 7 to Sept 20, 2009. To make up for the postage, Atis used stamps from the "Beijing 2008 Olympic Games" series. 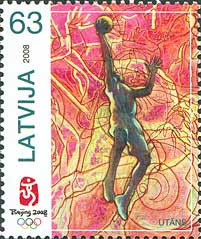 Coincidentally, the Olympic Games stamps also depict the sport of basketball. 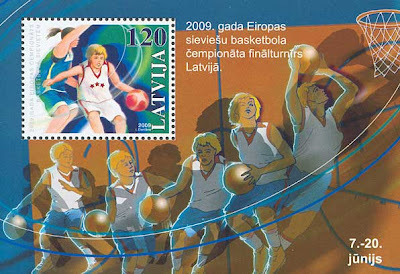 It is not surprisingly, basketball is sometimes mentioned as Latvia's national sport. 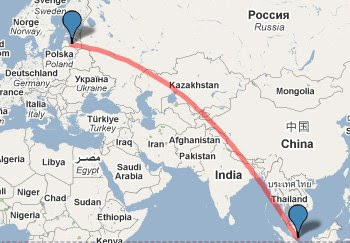 The 2 covers were postmarked on 27 June 2009 and took 7 days to travel an estimated distance of 9,259kms. I'm glad you have received both covers. 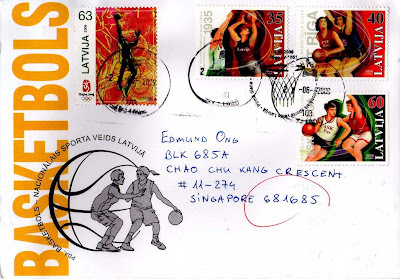 Just a small corrections - these covers and stamps for EuroBasket Woman 2009 which already finished and was held in Latvia.